Mike Khoury (violin), Jason Shearer (saxophone, clarinet, flute) and Ben Hall (drums, piano) are Michigan based musicians who play a highly melodic and expressive style of free-jazz. The music is firmly in the avant free-improv realm but is far more accessible than abstract. Throughout the set the violin and saxophone prove to be perfect partners, and Khoury's violin holds it own against the power of the sax. The trio excel at both wild playful jams and slow narrative statements that have an almost vocal feel. There's nothing noisy about this music, even at its most frenzied. My favorite parts are the fast paced but low key tunes in which the musicians are seemingly everywhere at once though the low volume and elusive intensity make it easy to focus on the excellent individual performances and realize what outstanding musicians these three are. The 11 minute "International" is a standout track that begins with some very nice harmonizing between the violin and sax. The trio is augmented by Maury Coles on second saxophone and the quartet soon take off into free-improv bliss land and do their frenzied dance before slowing the pace once again to resume their melodic recitation. 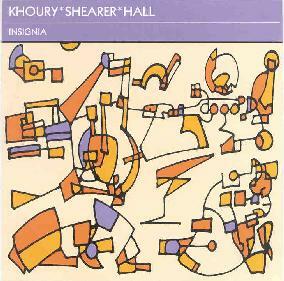 The addition of Coles naturally adds a fuller sound which surprisingly doesn't bury Khoury's violin. Throughout the set we also hear a lot of wild Carl Stallings cartoonish stylings, particularly on my favorite track, "8 Mile, Between Woodward And 75". Shearer switches instruments on a couple tunes, picking up the clarinet for "Last Date" and flute for "Six And Lodge". And Hall leaves his drum kit to sit down at the piano bench on "Grand River AT M.A.C", though he's disappointingly buried by the violin and wailing sax. Overall an excellent set of well thought out free-jazz with a composed feel and played by proficient, expressive musicians.